Each year at about this time members of The Ohio Ornithological Society mail out to each member the Ohio Cardinal. To quote their web page the Ohio Cardinal is a “comprehensive summary of the season’s observations across the state, highlighting not only the unusual but also the interesting patterns discernable in the usual”. It’s not a very large publication, only 36 pages, but it’s jam packed with all sorts of info that birders love. And smattered throughout the book are several pictures that are mostly in black in white, unless you’re the lucky one to either get your picture on either the front or back covers. And it’s an honor to have one of my pictures make it into this years publication. I was first contacted by Laura Keene the newly elected Photo Editor of the Ohio Cardinal. Laura lives in the same general area as I do, so we’ve meet once or twice. We also follow each others Flickr photostream, so we’re familiar with each others work. She’s an exceptional photographer as a matter of fact. Well she must have seen my photos from when Jon and myself went to Hoover Reservoir in Columbus to look for the Buff-breasted Sandpipers. Well she must have liked one of my pictures because it was featured in the Ohio Cardinal. 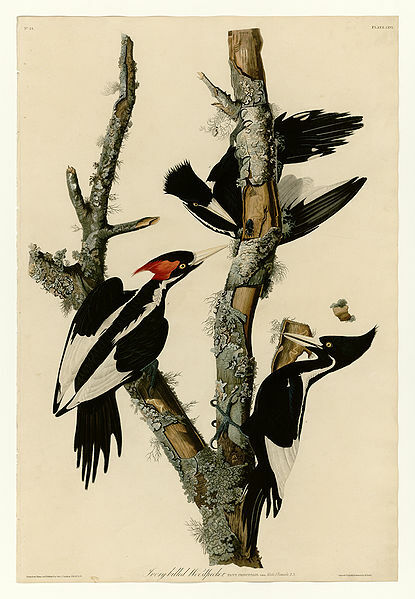 If you’re a birder you know what it means to be a “lister”. Now if you happen to be acquainted to a birder and wonder what all the fuss is about keeping a list, well you don’t know the half of it. Birders can be rather fanatical about their lists. This hobby just screams to have several lists, and I’m not talking about your everyday kind of “life list” here. Now if you’re someone who’s doing a Big Year it’s perfectly understandable to keep a list for all the birds you saw for that year, however people do go to extremes. We have lists for state birds either for a year’s time or for life, county lists, yard lists, vacation lists, day lists, Christmas count lists, even lists of birds seen on TV. Myself I have a couple lists which include my life list, and my yard list. Both can be viewed from the home page at the top of the page. And every once in awhile I go onto eBird and see where I’m standing in the state and the surrounding counties. And during January I’ll once again attempt my “January 100 Species Challenge”. Now I’m keeping a new list which is a little unusual, Remember a few blog posts back where I talked about a live feeder cam located in Ontario Canada. As I visit this camera I just can’t believe some of the birds I’ve seen so far and now I want to keep a list. In other words it’s my “Internet Yard List”. I can’t believe how nerdy this sounds, however when you see the list of the birds I’ve seen, you’ll want to check out this feeder cam. For those who don’t remember the link to the camera here it is. Now here’s my list so far, which might not be too impressive but remember I don’t just sit in front of my computer and stare at this feeder cam all the time. 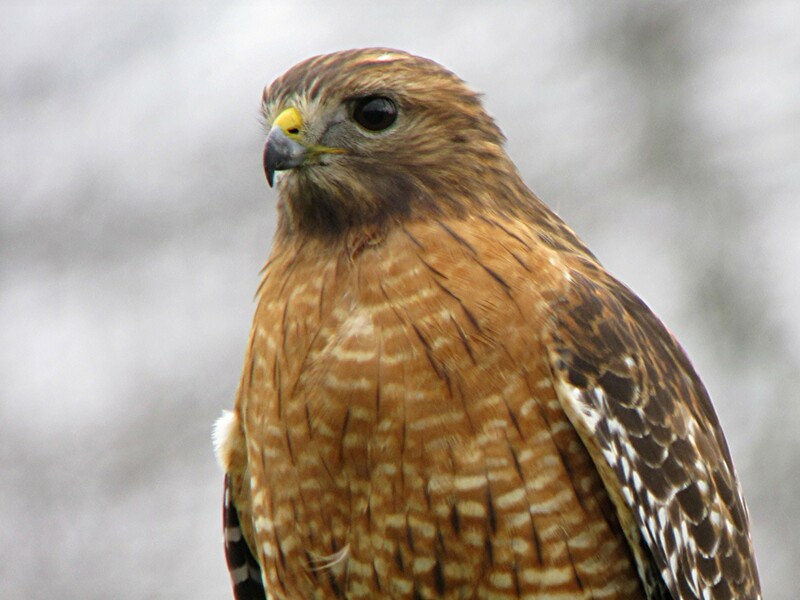 Red-shouldered Hawk from my dining room window. Finally, after how many weeks I found some time to get some birding in. Even though it was for just a few hours it felt good. Despite the fact that the gutters needed to be de-leaved Jon and myself hit the Caesar Creek circuit with enthusiasm. Cleaning the gutters will have to wait. We left the house at 8:00 am and headed northeast along route 22/3 towards Caesar Creek. Reports are starting to filter in on some duck movement and our first stop will be the Harveysburg Road overlook of the lake. If your not familiar with Caesar Creek Lake one of the things you might notice is that roads just dead end at the lake. In the 1970’2 when they dammed up Caesar Creek to create this 2,830 acre lake homes and communities were destroyed. Homes of historic significance were moved to the Pioneer Village. However when the lake level rose, the roads stayed. And Harveysburg Road is one such road. A great vantage point to view a large portion of the lake. However the day proved to be a bust when it comes to ducks. 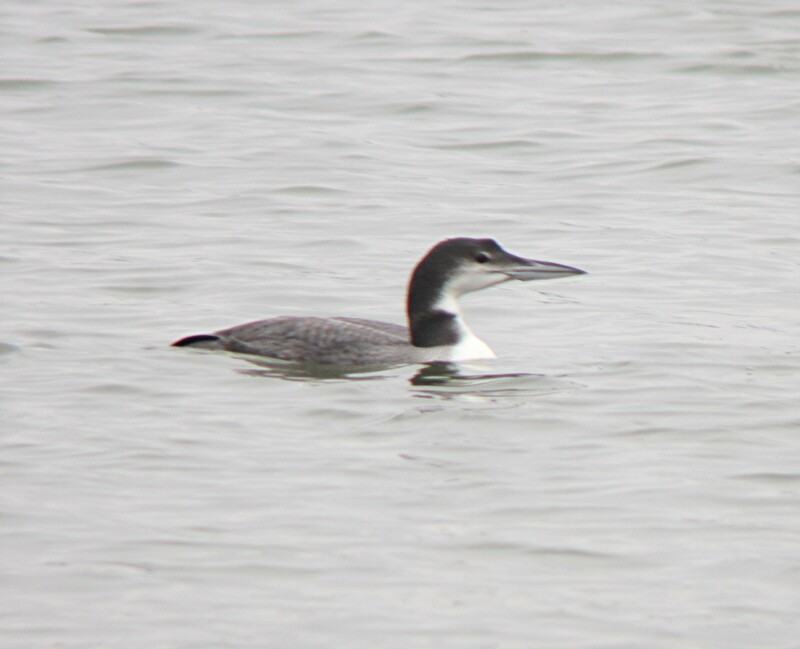 Bonaparte’s Gulls, Common Loons, and a pair of Horned Grebes were the only birds seen. It was interesting to watch this one Common Loon as it feed. 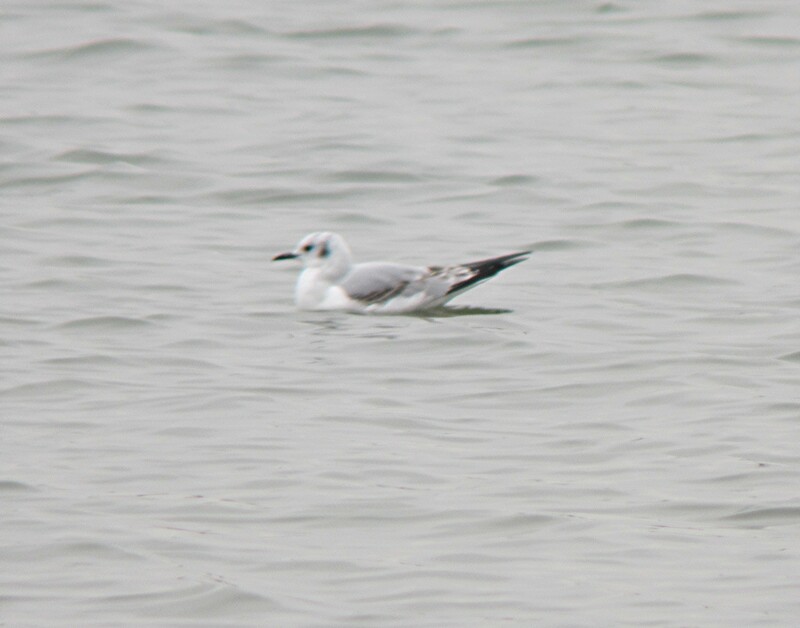 The Bonaparte’s Gulls were harassing it as it dove to feed. It looked like they were feeding on the scraps of whatever was left over of what the Loon kicked up. Bored with the obvious duck nothingness of the lake, we headed off the the far end of the lake to the Mounds Road mudflats. We parked at the turn a round and made our short walk back towards the lake. The mudflats were virtually empty except for a few Killdeer and a Great Blue Heron, however the show of birds were above us. 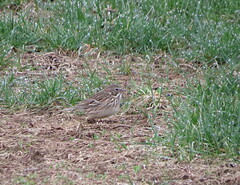 Passerines were everywhere. Brown Creepers, Butter-butts, Bluebirds, Song Sparrows, and loads of Golden-crowned Kinglets. I can’t remember the last time I saw this many concentrated in this one small area. It certainly a nice distraction from the lack of waterfowl on the lake. As we stood looking up towards this wonderful sight of avian beauty the urge to move on finally overcame us. With the passing minutes, and the chore list still staring me in the face, we moved on to Spring Valley Wildlife Area. Since Jon was driving I showed him the best way to get there from where we were. Since I bird in the area more than he does knowing the back roads helps in shortening up the travel time between stops. Since Spring Valley is a Wildlife Area hunting does occur, especially during Autumn. Yesterday was no exception when we ran into Squirrel hunters. We first checked out the bird blind. No food in the feeders, no birds. 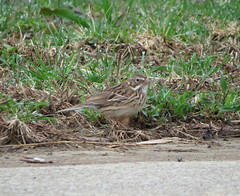 The walk down hill towards the marsh was uneventful as a few Swamp Sparrows played hide-n-seek with us. We walked the boardwalk slowly, stopping and listening as we made our way towards the observation platform, with it’s newly repaired guard rail. The wind started to kick up as we made our way on. “Chip” notes were heard, but no birds. Birding can be a challenge here. You know that there are birds deep within the reeds, so patience will pay off for you eventually. As it did today as we were walking back down the boardwalk. As we were about to step off Jon heard something similar to a Red-winged Blackbird call note, but softer. With the wind in my ears I heard nothing till I strained against the wind. Then we heard it it sing. Softly, unlike we they sing in the Spring. But it was the unmistakable song of a Marsh Wren. A late Marsh Wren. But just like last year Jon and myself were able to prove that Marsh Wrens do winter over at Spring Valley and the bird today was a good sign of it repeating again. We located where it was singing from and waited till we spotted it after a few “pishes” from Jon. Confirmed. We were happy. I think repeat visits to the boardwalk throughout the winter will be necessary to confirm that they do winter over every year. As the afternoon wore on and the decision to leave was made we were treated to the flute-like, melodic voice of a Hermit Thrush was heard. This time of year it really is unusual to here these birds sing, but there he was sitting on a branch singing ever so softly. 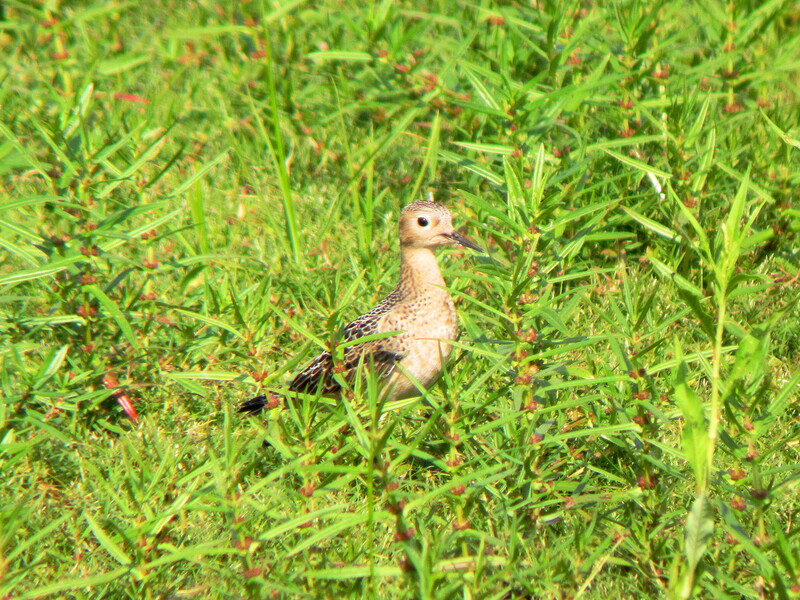 And when I went to grab my spotting scope and camera, he disappeared. Which is always the case. Well it was a good day, even with no waterfowl to look at. And as we made our way home the discussion came up again about a birding trip to Texas for the Rio Grande Valley Birding Festival in a couple of years. More on that as the time approaches, until then here is the bird count for the day. Granted this part of Ohio doesn’t seem to be getting an exciting variety of rarities as they seem to be getting along Lake Erie, however we’ve had not one but two confirmed sightings and subsequent banding of 2 female Rufus Hummingbirds. Bill Stanley who was the lucky one last year to have one come to his feeder in through December, he has one of the two this year. 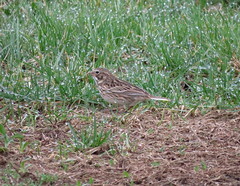 And a totally different bird as well. What are the chances of that happening? Anyway a very cool. Leave it to The Cornell Lab Of Ornithology to off up some live feed video cameras so we can get our bird watching fix online. The first feeder cam is located in Ontario Canada, just north of Thunder Bay on Lake Superior. I can only imagine the types of birds that will frequent this feeder as winter progresses. Gray Jays, Boreal Chickadees, Common Redpolls. The first time I tuned into this web cam there was a small flock of Evening Grosbecks gorging themselves on Sunflower seeds. Here’s the link to this feeder cam. Besides being out in the field birding with friends, I can’t help but love watching them at the feeders. I could sit for hours with binoculars in hand just watching my feeders as even the lowest House Finch bullies the other birds from HIS feeder. Now to have the opportunity to watch birds come to a feeder that would never come to any ordinary feeder like mine, is so much fun. The second feeder cam is located at Sapsucker Woods at Cornell University. Maybe not as exciting. Here is the link for this feeder cam. With the “Winter Finch Forecast” looking dismal for our part of Ohio, it looks like I will be watching vicariously at these feeders throughout the season. Here’s a link to E-birds full Finch Forecast.